Buying a new car doesn’t have to be a confusing experience. With a little know-how you’ll be able to balance your desire for a brand-spanking new car with the trepidation of dealing with a complicated financial decision. And understanding what salespeople at a dealership are saying is a good place to start. It often sounds like they are speaking a foreign language. You might overhear one salesperson tell another, "I got the four square out and the customer had agreed to a price of $1,000 over invoice after spiffs, when suddenly he balked over the out-the-door." Any business has its own jargon, and car dealers have been saying stuff like this so long that they don't even realize they're doing it. However, it’s going to give you a leg up if you can follow them. We've picked out five common dealership terms and laid out what they really mean. Even if you think you know what invoice price or GAP insurance are, are you confident enough to head into talks with a seasoned salesperson with what you only think you know? What you'll hear: "I'm telling you, I can't go any lower than $500 over the invoice price." What it means: Virtually all dealerships are franchises, and as such, they've purchased every car on the lot from the manufacturer at a discounted price. That discounted price is the invoice price. However, you probably know that dealers can go below that price; just think of all the ads you've heard about cars for sale "below invoice." So how can dealers sell cars for less than they paid for them? Simple: The invoice price isn't carved in stone any more than the window sticker price that you're negotiating from. The invoice price is what the manufacturer wants dealers to pay for inventory, but it doesn't always get that price. There may be factory-to-dealer incentives, or the dealer may just have a particularly savvy purchasing manager. Of course, it's also possible that the salesperson is showing you the actual price too. What You’ll Hear: "You're lucky. The manufacturer has a bunch of spiffs on your car." What it means: The manufacturer is offering cash back, rebates, cut-rate financing or lease terms, or other incentives to get the salesperson to sell a particular model. There are two main kinds of spiffs: Cash rebates or cut-rate financing. Cash rebates are pretty self-explanatory: It's money the manufacturer gives back to you after you purchase the car. Let's say you're buying a car with an MSRP of $20,000, but with a $2,000 cash back rebate. With no negotiation, you'd pay only $18,000 on the car. Not bad, huh? Best of all, this doesn't come out of the dealership's pocket, so you can still negotiate the price as normal. The second kind is a special loan or lease deal through the manufacturer's financing arm. If you're financing these can be a real money saver in the long term, but only if you have an excellent credit score. What You’ll Hear: "Let's work out your payments on the four square here." What it means: A four square is a sheet of paper divided up into, surprise, four squares. The square represent your current vehicle's trade-in value, your down payment, your monthly payment and finally the total price of the vehicle. 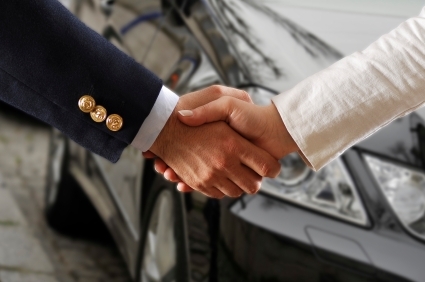 It's the dealer's primary negotiating tool to determine what you'll ultimately pay for your vehicle of choice. Generally speaking, salespeople will concentrate on the monthly payment square, to show you how small your monthly will be. And admittedly, it's pretty tempting to focus on that. However, don't ignore the others, especially the final price. Even if the salesperson comes up with a monthly payment you can afford, if it's on a car that's overpriced, you're not getting a good deal. What You’ll Hear: "Before you drive away, be sure you have GAP insurance." What it means: So here's the scenario. You just bought a new car for $25,000. On your way home from the salesperson, you're in an accident. The insurance adjuster comes out, inspects your vehicle, and declares it a total loss. You then get a check for $20,000, and a note saying that's the car's fair market value. What happened? You don't have GAP insurance, that's what. It's a well-known rule of thumb that a car's value drops 20 to 30 percent the moment you drive it off the dealer lot. That lower price is the fair market value, and it's what your insurance company is willing to pay to replace your car in the event of a catastrophic accident. If the fair market value is below the purchase price – and it almost always is – then you're on the hook for the remainder. In other words, you'll wind up spending $5,000 on a car that's a pile of rubble. That's where GAP insurance comes in. The "GAP" stands for Guaranteed Auto Protection, but what it does is fill in the gap between the fair market value of your car and what you paid for it. Most of the time, if you're getting a loan or leasing a new car, GAP insurance is mandatory. Even if it's not, it's worth the small price to cover the difference. Contact your insurance company first, and find out if you're already covered. What You’ll Hear: "That's going to be an extra $2,000 out the door." What it means: If you've gotten the options you want, negotiated a killer deal, and even gotten the interest rate you wanted, you're done, right? Not quite. You still have state taxes, licensing and titling to deal with, and combined they can add up to a hefty sum that you may not have realized was coming. The purchase price, plus the taxes, license and title, is the out-the-door price. Let's go back to our $25,000 car. That's the dealer price to you. But then there's the cost of registering your car with the state, usually a couple hundred dollars at least. Then there's sales tax, which can add thousands to the price. Suddenly, your looking at a $28,000 price tag, and that extra money can be a shock. However, despite the fact that these are mandatory expenses, you still have some control over them. These fees are dependent on the purchase price of the vehicle, so getting a good price will not only lower your monthly payment, but your out-the-door costs as well.